The ELEAGUE Major: Boston finals saw two of the best teams face off in CS: GO. The dominant FaZe and the hometown boys Cloud9 go head to head. Throughout the ELEAGUE MAJOR: Boston FaZe has looked like a force to be wrecking with. In the quarterfinals, FaZe took on Mousesports. In the first mouth, the match seem to be fairly even with FaZe and Mouseports going back and forth. However, it was FaZe who proved to be the better team ending the first map with a 19 - 16 win. In map 2 it seems that Mousesports lost all momentum as FaZe dominated most of the way with a 16 - 9 win. The same would be repeated the following day at the semifinals as FaZe took on Natus Vincere dominating both maps 2. FaZe won in map with a 16 - 9 win then in map 2 wins with a 16 - 7 advancing to the finals. Meanwhile on the other side of the card Cloud9 journey in the quarterfinals also appear to be smooth sailing. In the quarterfinals, Cloud9 feated G2Esports in both maps with an impressive score of 16-8 in map 1 and 16 -7 in map 2. This lead Cloud9 to face SK Gaming who did a doubleheader after a grueling battle with FNATIC. Cloud9 won map one with a strong opening of a score of 16 to 3. However, SK Gaming returned with a win of their own taking map 2 with 16 to 8. It was the nail-biting map 3 where the audience truly came alive cheering the hometown heroes. Cloud9 prevails leading us to the finals. The day of the finals hope was very high as the hometown heroes enter the arena to a standing ovation. The crowd roaring as the maps were selected. The first map to kick off the finals was Mirage. Cloud9 had an amazing strong opening taking the lead very early with a score of 7 to 1. Cloud9's Tyler "Skadoodle" Latham is responsible for the strong lead taking out the opposing FaZe with strategic movements, well-placed timing, and accuracy. It would seem that Cloud9 had this map in the bag. However, with time comes an understanding of your opponents way of thinking and FaZe caught on very quickly to Cloud9 and came back with four round wins to get better access to more weapons. While Cloud9 did shift the momentum a bit it was FaZe who would get the best of them in map 1 ending the first map with a close 16 to 14 win. 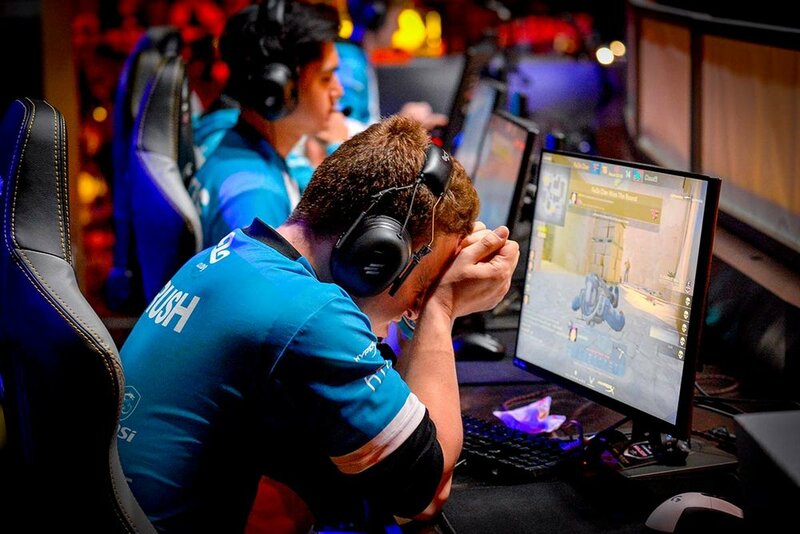 Frustrating ensues as Cloud9 loses Map 1: The Mirage. Photos courtesy of Turner Sports. Overpass was the map selected for map 2 and Cloud9 is now in a do or die situation. Cloud9 once again started off strong with a 3-0 lead. However, it won't be long before FaZe retaliated back but with the championship on the line. FaZe's Rain showed up in the pistol rounds taking three kills very quickly to shift the momentum back in their favor. It was Stewie 2k and Tarik who sealed the deal with this map as both players showed up to take the lead leaving FaZe in 3 to 1 situations. Tarik landed a triple kill that lead the team to a 16 - 10 win and gave hope back to Cloud9 for the final map Inferno. With all the momentum from the previous map, Cloud9 started off with a 5- 1 lead even with losing the pistol round to FaZe. This didn't stop FaZe from making a comeback with an impressive comeback to take the half of 8 to 5. After the break FaZe finally look like the dominant force like how they were throughout the entire ELEAGUE: MAJOR Boston. FaZe didn't let up by not giving Cloud9 any room to breathe. It seems that all hope was lost until Stewie2K injected the hope in the team winning round after round until we reached overtime. The atmosphere, the tension, and pressure on the players' faces can tell the story better than we can ever write. The first overtime did not give us a deciding winner with FaZe coming back from a 15 - 18 deficit to tie the game. However it was overtime two is where Cloud9 would rally as Tarik would be the hero of this overtime to give Cloud9 the victory with a score of 22 to 19 to become the ELEAGUE MAJOR champions.